Ulster is developing a breakthrough leak-no-burst safety technology to fully avoid explosions from high pressure tanks in a fire. 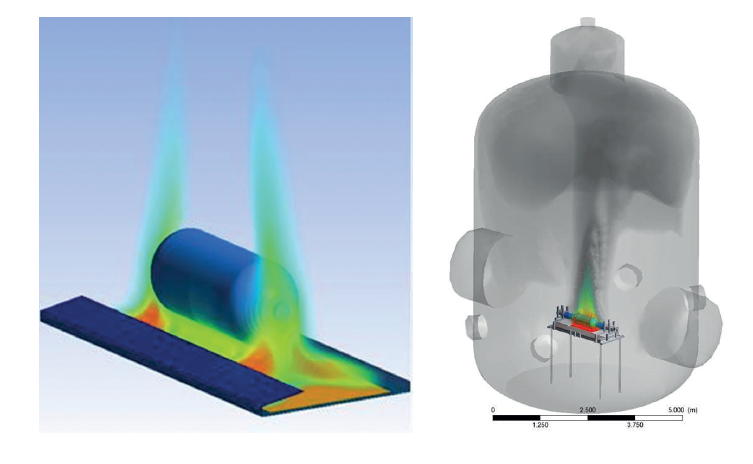 Contemporary 3D CFD models of conjugate heat transfer from a fire through a composite material wall and liner to stored hydrogen have been developed (as illustrated in Figure 2.5) and are being validated against unique tests performed at laboratories of Ulster University’s international collaborators. Example images generated from computational models looking at fire resistance performance of high pressure tanks under fire. The aim of the project is to investigate and optimise metal hydride based technologies that are extremely compact but also have a high level of safety. A modular design will be adopted, where a module is sized for the smallest application (i.e. daily top-up for a commuter vehicle) capable of scale up. The objective is to get 1) a MH store with a tank capacity up to 60 g(H2) L-1 exploring container to the bed formulation, heat transfer and recovery mechanisms, economically viable store materials, container and fabrication methods, to demonstrate mass deployment feasibility and 2) a MH cascade for compressing hydrogen from 10 to 350 bars. It is anticipated that when the prototype compressor is completed it will be used in the University of Nottingham’s Energy Technologies Building as a demonstrator for wider acceptance of hydrogen technology for academic and public visitors. For an extensive presentation on the project’s current progress, click here. the development of novel liner materials and engineering solutions for safe storage. The increased fire resistance rating of hydrogen storage tanks will allow industry to decrease the exit diameter of pressure relief devices, thus reducing destructive pressure peaking phenomenon, and deterministic separation distances. So far the project has experimentally confirmed a major increase in the fire resistance of an on-board 700 bar hydrogen storage tank, from 8 min to above 110 min.